The front seats and rear outboard seats have lap/shoulder belts. These belts have retractors with inertia locks that keep them out of the way when not in use. The locks allow the belts to remain comfortable on users, but they will lock in position during a collision. The 3-point type seat belt has lap/shoulder belts. This belt has a retractor with an inertia lock that keeps it out of the way when not in use. The lock allows the belt to remain comfortable on the user, but it will lock in position during a collision. Always wear your seat belt and make sure all occupants are properly restrained: Not wearing a seat belt is extremely dangerous. During a collision, occupants not wearing seat belts could hit someone or things inside the vehicle or even be thrown out of the vehicle. They could be seriously injured or even killed. In the same collision, occupants wearing seat belts would be much safer. Do not wear twisted seat belts: Twisted seat belts are dangerous. In a collision, the full width of the belt is not available to absorb the impact. This puts more force on the bones beneath the belt, which could cause serious injury or death. So, if your seat belt is twisted, you must straighten the seat belt to remove any twists and to allow the full width of the belt to be used. Never use one seat belt on more than one person at a time: Using one seat belt for more than one person at a time is dangerous. A seat belt used in this way cannot spread the impact forces properly and the two passengers could be crushed together and seriously injured or even killed. Never use one belt for more than one person at a time and always operate the vehicle with each occupant properly restrained. Do not operate a vehicle with a damaged seat belt: Using a damaged seat belt is dangerous. An accident could damage the belt webbing of the seat belt in use. A damaged seat belt cannot provide adequate protection in a collision. Have an expert repairer, we recommend an Authorised Mazda Repairer inspect all seat belt systems in use during an accident before they are used again. Positioning the Shoulder Portion of the Seat Belt: Improper positioning of the shoulder portion of the seat belt is dangerous. Always make sure the shoulder portion of the seat belt is positioned across your shoulder and near your neck, but never under your arm, on your neck, or on your upper arm. Positioning the Lap Portion of the Seat Belt: The lap portion of the seat belt worn too high is dangerous. In a collision, this would concentrate the impact force directly on the abdominal area, causing serious injury. Instructions for Use of Seat Belt Assemblies: Seatbelts are designed to bear upon the bony structure of the body, and should be worn low across the front of the pelvis or the pelvis, chest and shoulders, as applicable; wearing the lap section of the belt across the abdominal area must be avoided. Seatbelts should be adjusted as fi rmly as possible, consistent with comfort, to provide the protection for which they have been designed. A slack belt will greatly reduce the protection afforded to the wearer. Care should be taken to avoid contamination of the webbing with polishes, oils and chemicals, and particularly battery acid. Cleaning may safely be carried out using mild soap and water. The belt should be replaced if webbing becomes frayed, contaminated or damaged. It is essential to replace the entire assembly after it has been worn in a severe impact even if damage to the assembly is not obvious. Belts should not be worn with straps twisted. Each belt assembly must only be used by one occupant; it is dangerous to put a belt around a child being carried on the occupant's lap. No modifi cations or additions should be made by the user which will either prevent the seat belt adjusting devices from operating to remove slack, or prevent the seat belt assembly from being adjusted to remove slack. Belt retraction may become diffi cult if the belts and rings are soiled, so try to keep them clean. 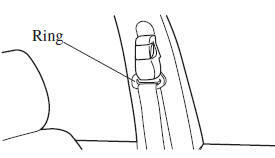 For more details about cleaning the seat belts, refer to "Cleaning the Lap/Shoulder Belt Webbing" (page 6-74 ). Pregnant women should always wear seat belts. Ask your doctor for specifi c recommendations. The lap belt should be worn SNUGLY AND AS LOW AS POSSIBLE OVER THE HIPS. Persons with serious medical conditions also should wear seat belts. Check with your doctor for any special instructions regarding specifi c medical conditions.